Sunday, October 26th, began on the lake. In the above photo, Tero (in yellow) is preparing a seining net. Seining is a type of net fishing that dates back over 10,000 years. 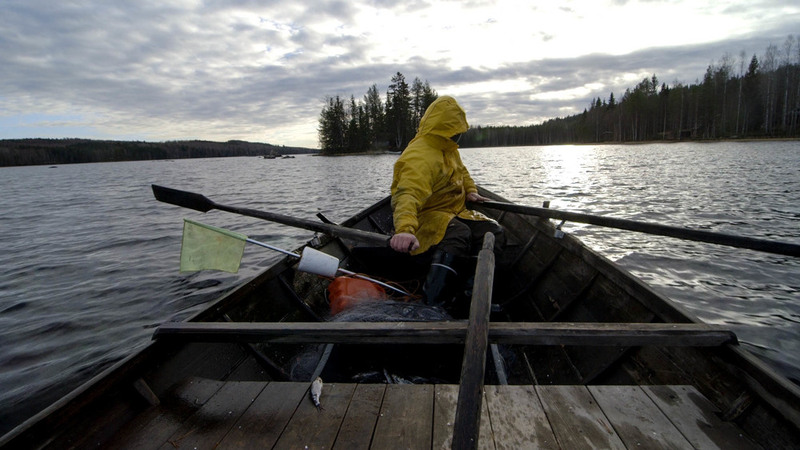 The practice has faded from use over the last century, but has recently been reintroduced and rejuvenated, and is again being practiced in various lake around Finland. In the evening, we took the fish back to Tero's to smoke, then saunaed and ate. Monday was a plethora of interviews including the head of the hunters in Selkie, a noted scientist Heikki Simola, a representative of OTSO (the company that built the small Alavi wetland unit), the chief administrator for the municipality of Kontiolahti, and Antti Suontama, an environmental officer, also with Kontiolahti. Tuesday began with a walk in the forest with Tero near his home. We talked about the role of forests for Finns, forestry types, and we shot a lot of b-roll. In the afternoon Nuin-Tara and I went into Joensuu with our host - the architect, Antero Turkki - and he showed us a seminary and church that he designed. We filmed inside the Greek Orthodox church, and recorded some of the singing. On Wednesday, we were invited to talk at the local elementary school. We talked for half an hour about our project, then fielded questions from the kids - questions like: in America, do you keep any pets that are poisonous? Or, in your travels to Nicaragua, how many poisonous or dangerous animals did you see? Mostly, a lot of poisonous animal questions, but one boy asked how our elementary school system in the states compares to Finland’s system. It's been over 25 years since elementary school, so I really didn't have a good answer for him. After our school session, we drove to the town of Nurmes - where Soile's family lives (Soile is our audio intern) – and on the way stopped at Koli park and did a bit of filming with the quadcopter. In the evening we interviewed Soile's mother, Hilkka, a lawyer who has been instrumental in helping to implement the restoration project in Selkie. Hilkka fleshed out the nuances of the legal issues and talked about the relevance of the Jukajarvi river restoration project in a broader context. After the interview, we ate a wonderful dinner of baked cod (caught by Soile's father in Norway) and veggies from their garden. After, we took sauna, and slept like logs in their cozy fishing cabin. On Thursday, after breakfast, we went back to Koli for additional footage and a short hike before heading back to Selkie where I went out with Tero and filmed him setting his fishing nets. Friday morning, Oct. 31st, Tero and I were back on the lake. After checking Tero's nets, we headed out to a small communal fishing cabin on the lake, where I filmed six local fishermen cleaning their nets of fish. We also had lunch and coffee in the cabin and talked shortly about the changes the fishermen have seen in terms of the weather, the lake, and the fish. Later that evening was the annual Selkie Moose Feast, which we found out was a traditional event across Finland (Soile, our wonderful production assistant, shared with us her memories of going to the Moose Feast in her town when she was young). Candles along the drive – setting the stage for a cozy night of food, dancing, and celebration – welcomed us to the newly renovated Hunters Lodge. Families and friends gathered in the entrance hall, buying raffle tickets and waiting for the feast to begin. Once the doors opened, the line of attendees snaked through the dining room to get a selection of traditional feast dishes, including carrot and rutabaga casseroles, dark rye bread, lingonberries, and of course, moose stew with potatoes. The dinner line continued for over an hour, with families and friends of all ages circulating through the packed room – as one group would get up from their meal, their seats would be quickly taken by the next round of people. After dinner the festivities moved upstairs for a few brief speeches and the raffle where, incidentally, Nuin-Tara won the first raffle prize of the evening – 5 pounds of moose meat! (BTW – this was the first time Nuin-Tara has won a raffle prize, but unfortunately for us we passed on our prize to our hosts since traveling with frozen moose meat can get tricky.) After about an hour, the raffle finished up and the floor opened up for some dancing, including traditional Finnish Tango. The Tango became popular in Finland almost a hundred years ago but it was during World War II that a more distinct ‘Finnish Tango’ evolved. After many songs, we said our goodbyes and headed home after a lovely evening. Saturday and Sunday: These days were full of filming b-roll. Sunday included formal interviews with Tero and Kaisu, and we spoke with another reporter for the regional newspaper, the Karelian; the following day we discovered ourselves front page news! The best thing to come out of all the coverage we received in Finland, was that it brought a lot of attention to the river restoration project in Selkie. "We and Japanese have something in common: we like karaoke and we have this very close relationship with nature... and [the] humming of the forest is one of the most beautiful sounds I know. And these are ancient things. Must be in our genes. The Fireplace. Waves. Humming of the trees. Cause when we meet those things we become very philosophic. Even more quiet than normal." After a pause, he returned to the original question: "How does it feel to be a Fin? That was the question?" Then he smiled and concluded, "No complaining." On Tuesday, we had a meeting with Tero and discussed the future: the film release, the Selkie-only version of the film, and our return trip in the spring and what we plan to cover during that trip. (Yes, OPOE will be returning to Selkie sometime in the spring to share a rough-edit of the feature-length film, and to review the Selkie-only version.) In the afternoon, Nuin-Tara and I went out to capture some last-minute b-roll. Around 4PM, Tero phoned and told us that Hannu (a local fisherman) had a fish dinner waiting for us and we headed over there. After dinner we said our goodbyes to Hannu and his wife Päivi, and headed home. Later that evening, while reading in bed, Tero showed up at our door and ask us to come outside. Hannu was there in the driveway standing next to an upright log. The night was rainy and windy, but after just a minute Hannu had set the log ablaze and we all stood around watching it burn hotter and hotter. A rough translation is lumberjack candle. Lumberjacks and hunters make four cuts down the middle of the log and set them alight in the forest to keep warm. The log burns from the inside out, and the heat increases as the inside turns to hot coals. This candle was OPOE's goodbye from Hannu. It burned for almost 2 hours, the wind sending cascades of sparks sailing across the dark field.